An advantage to writing for site like this is the willingness and directive to look into things that are at the edge of technology and watch the progress. The reporting can be just a joy, but for years now the joy has been smeared by the motives of a few in an important field. Steven E. Jones, a competitor for patent rights to Martin Fleischmann and Stanley Pons re-misnamed the Fleischmann and Pons phenomena ‘cold fusion’ which was at the time called muon-catalyzed fusion. For simplicities sake we’ll just call the phenomena Cold Fusion. That opens up the first lost battle. Here we go! No one yet knows just what is exactly happening in a cold fusion experiment. The fundamental event isn’t nailed down. Some say there are hundreds of theories and cold fusion can’t take off until there is just one. But in fact – what does matter is that experiments work, get developed and become worthwhile products. There is some reason to expect that the reality of demand might not wait for the ‘One Grand Theory’ answer for everyone. It is important to get the theories proved up – just don’t expect any one or perhaps more than one to satisfy the human need for a single answer. In that battle is the concern about what comes first, the science or the satisfaction. By that this writer means the emotional need for science to use language to explain, the ‘satisfaction’ if you will allow – or the science moves on anyway and drives to useful products in the form of hardware doing work. If it was 1989 still, the answer would have to be satisfaction wins out, but its 2010 and leaving the potential unexplored is a serious dereliction of duty for science, public policy and business and personal planning. With the mass of academic and private research of cold fusion now becoming available which has been going on while the mass media and the establishment of science relaxed in the success of smearing the unexplained, most anyone with a high school college prep background can catch on easily. Its becoming time for the foolish assassination of a new science discovery to be cast into irrelevancy – something science leadership has neglected doing for two decades. The evidence at hand is beyond doubt – only the most grasping fool can hold out now for intransigent ignorance as a defense. It’s not a smart career move to take a self-satisfying emotional side against the cold fusion phenomena. It’s not going to go away. The battle is lost. Next is the experiments are getting data that lead to very curious results and increasingly more valuable potential. The dissenters over the years have bemoaned the absence or small volumes of fusion byproducts such as tritium and helium forms that come from the fusion of hydrogen while overlooking the excess production of heat from the energy put in to drive the experiment. Not paying attention has the dissenters in a corner; some experimenters have veered into transmutation or fusion by another word, and can produce element transmutation from one to another. The battle about evidence is not only lost – its become an incredible routing of the dissent – much more can be made to go on in cold fusion experiments than generate a little heat. Even more alarming for dissenters is the mass media seems to be cracking open to the real facts. The highly regarded CBS network show 60 Minutes covered the cold fusion matter and comes away with a basic sense that cold fusion is real science, stunted but growing and closes with an interview with Dr. Fleischmann to say that the products that would give us very low cost energy supplies could be much closer than it seems. Progress demands better answers without regard to the dissenter’s opinion or effort to reign supreme with old science over the new. This battle too is lost, and may well offer a very unpleasant recoil on the dissenters. It might be a very good idea for the dissenters to just keep quiet. That deliberate misleading over the years can still come back for a painful haunting. Outside the mass media there are proponents using various tools to correct the perceptions of interested people. 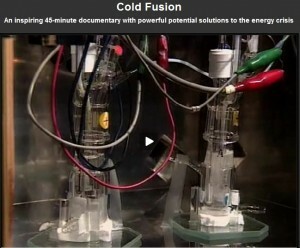 One such is a self-improvement site with a documentary styled review of the history of cold fusion. The work does serve to arm those wishing to see the science progress with public relations information that if applied with skill would be devastating to dissenters. The battle here is lost as well and time and progress is changing the battleground into a mortuary where dissent has grave risks easy for both sides to see. Cold fusion is becoming another example of dissent losing before the march of progress. A Cold Fusion Apparatus. Click Image to go the Video Page. The battleground of significance for many is the peer review journal publishing of papers. Here the U.S. field has been led into a position of dire weakness. Other nation’s journals are far ahead and acquiring the expertise of peers for reviews. This has negative effects across the full research spectrum from the students yet to enroll, to professors and teachers and on to the people responsible for grants and funding. The leading edge of research isn’t in the place the population of the world expects – the U.S. Publishing, the exchange of ideas between researchers, the basis for education and the foundation of choosing the best use for money through grants and funding is the last battleground. With the other battlegrounds lost and the competition for relevancy, competency and integrity at stake the arena itself is at risk. Publishers have made a conscience choice to support dissenter’s views at extreme loss, which not in evidence yet, will be evident in the coming years as others take the ascendancy with the importance, depth of information and professional confidence. These institutions are repeating the recurring error of choosing the established norm over discovery – a certain path to self-destruction. This battle too, is lost with the damage continuing to fester and infect the participants. Alternatives exist with repositories of data such as the LENR-CANR Library with connections to the publishers and papers that provide the open view. The old dissenting publishers are not just lost, but left out as well. Which in turn leaves out the students, educators, grant personnel and government policy makers. The disease state reaches to the potential of business and consumers. The war is lost – the damage is severe across the entire U.S. economy. Dissenting against the unknown or unexplained discovery is as one dissenter puts it – pathological science. It’s time for the dissent to be stopped and restart the questions, research and development of science to retake dissent’s place. Thanks for an interesting and informative site, which is in my favorites list and I regularly check. However in this instance I found the article confusing, as the use of the term ‘dissenters’ was ambivalent. I had understood that the cold fusion movement is usually regarded as being the dissent from the orthodox establishment, but here this seems to be reversed. The article’s argument remains entirely obscure to me at least. I have replicated the experiment myself… Cold Fusion??? I can’t say that it is, due to the missing by-products. I did find that it boiled off more water than it should have for the energy input. The highest return was a 40% increase over the input energy and the average about 17%. Figuring in the cost of consumed material and the energy used to create them and to power the unit, over-unity falls from view. Precisely how have you figure all of this out relating to this topic? I enjoyed reading this, Ill need to visit other pages on your site straight away.